Action Wobbles: Love Note from Midge! Well hey there! 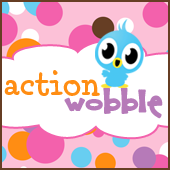 Midge here, and I am excited to be back as the featured designer for Action Wobbles today! I decided to get a jump start on the next holiday, you know, the one that's all hearts and flowers :) LOL. I have a fun Valentine card to share today. I just LOVE the vintage papers but the card wouldn't be complete without a little "wobble"! Two Action Wobbles to be precise :) I trimmed the wobbles down and placed one under the black heart and one under the tan heart. Well I hope you enjoyed this little love note! Have a crafty day!!! What a BEAUTIFUL Creation! !Love this vintage look!